With the arrival of Henry Hudson in 1609 to the end of Dutch rule and subsequent “Act of Surrender” to England in 1664, THIRTEEN brings this early history of New York City, Albany and places in between to life in a new 60-minute documentary commemorating the 400th anniversary of Hudson’s epic journey to the river that bears his name. Dutch New York premieres Thursday, September 10 at 8 pm on THIRTEEN. The broadcast coincides with NY400, a week-long, city-wide celebration of Dutch culture in New York. Dutch New York is a production of THIRTEEN in association with WNET.ORG – one of America’s most prolific and respected public media providers. 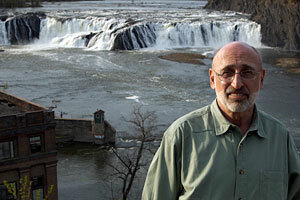 Historian Barry Lewis, host of THIRTEEN’s Walking Tour series, takes viewers to key locations around New York – from Wall Street to the Bronx, the East river to the outer boroughs, and upstate to Albany and Cohoes Falls – to offer insight into how Dutch ideals in politics, religion and trade shaped the people and island of what would become New York, into one of the most influential and thriving cities among the American colonies. Dutch New York features interviews with experts including Dr. Charles Gehring, Director of the New Netherlands Project, Dr. Eric Sanderson from The Mannahatta Project, and historian Dr. Joyce Goodfriend from the University of Denver. The program also examines the dynamic between the early Dutch settlers and the indigenous Peoples of Mannahatta as they established trade relations – first in beaver pelts, then in the famous purchase of the Island itself for $24. Barry Lewis was born and raised in New York City and educated at the University of California at Berkeley, the New School for Social Research in New York, and the Sorbonne in Paris. For the past 25 years he has lectured for institutions as diverse as the Cooper Hewitt Museum, Bard Graduate Center, the University of Pennsylvania, and the Harvard School of Planning. Lewis has written on Midtown and Fifth Avenue in the guide book NEW YORK WALKS, and was one of the most sought-after tour guides for The 92nd Street Y’s popular walking tour series. His sections on New York City Architecture and the Borough of Queens appear in the current BERLITZ GUIDE TO NEW YORK. Lewis, who received the New York Society of Architects’ Distinguished Service Award for his work on Thirteen’s “Walking Tours” series, conducted a seminar on the neighborhoods of New York City at the Smithsonian Institution in Washington, D.C. and recently returned for a lecture on the 100th anniversary of Times Square. He currently teaches architectural and interior design history at The New York School of Interior Design, and also leads a course for the public on the history of New York City’s architecture and urban planning for Cooper Union Forum.